FALLING in love with a soldier can mean entering an alien world where frequent separation, lack of stability and deployment worries become the norm. Daisy Gibbs also felt disconnected juggling a long-distance relationship with her studies in Scotland. Her fiancé had to commute weekly from the base to be with her and their son. Male partners can find it particularly hard to adapt to military life; despite increased numbers of female soldiers, they remain a minority. 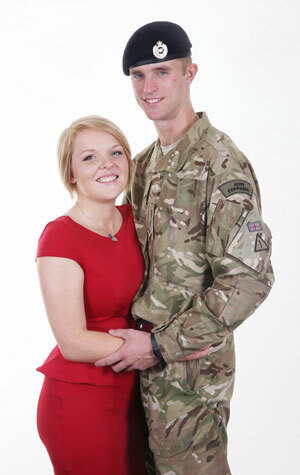 Stacey Sturman, who serves in Middle Wallop, met Rob 12 years ago and they recently married. Partners like Rob or Daisy – in a committed relationship, with children – can feel devalued and ignored by the system; non-dependants aren’t allowed onto camp unescorted, for example. Housing rules cause frustration, too. Service Families Accommodation (SFA) is prioritised for married personnel, so Daisy and Jamie have to wait until after their wedding next May to apply. In the meantime, they rent privately in the garrison at a higher rate than their married neighbours. The Sturmans have also experienced housing issues. During Stacey’s first posting Rob was only allowed to stay a few nights a week as they weren’t married, even though she had their newborn at home. When Stacey deployed, Rob had to move in with family members because he wasn’t entitled to remain in SFA. Having lived with her husband before their marriage, Bex Valentine, AFF’s Director Personnel, knows that the unit’s response to a “non-entitled person” can have a big impact. The Army says the challenge in supporting unmarrieds lies in relying on soldiers to provide accurate information about their dependants. Some soldiers don’t want to include their partner in work stuff or a partner may not wish to be involved, viewing the Service career as separate from normal life. “Unless the Army is informed about significant relationships, it cannot meet welfare requirements,” adds Major Dave Coward, SO2 Fam Reserves (PS4). It’s also important to check your soldier has told the Army about you because it could affect financial benefits; not all entitlements are based on marital status. Benefits outside those provided by the MOD could be affected too, for example insurance beneficiaries. The internet helps many unmarrieds join in with Service life and feel less isolated. AFF has appointed a Social Media Assistant to enhance its online support. “It’s an effective way of connecting with people we can’t reach through the SFA letterbox,” explains Catherine Spencer, AFF Chief Executive. Regimental Facebook pages advertise events geared towards spouses and partners. A relationship with a soldier clearly presents challenges unlike those experienced by civilian couples – but it has its upsides! “Jim and I really value our time together,” says Nic.